Magdalena Racing's unbeaten Dothraki Queen became the early points leader in the 2016 "Road to the Kentucky Oaks" and earned a Breeders' Cup "Win and You're In" guaranteed spot in the starting gate for the Breeders' Cup Juvenile Fillies with her victory under Corey Lanerie in the Grade II Pocahontas (Reed Palmer, Churchill Downs). Magdalena Racing’s Dothraki Queen was last with three furlongs to run in Saturday’s 47th running of the $200,000 Pocahontas (Grade II) at Churchill Downs, but the 2-year-old filly rallied through a narrow opening along the inside rail, grabbed the lead with three-sixteenth of a mile to the finish and turned back a late charge from New Jersey invader Bold Quality to win the 1 1/16-mile event by a half-length. 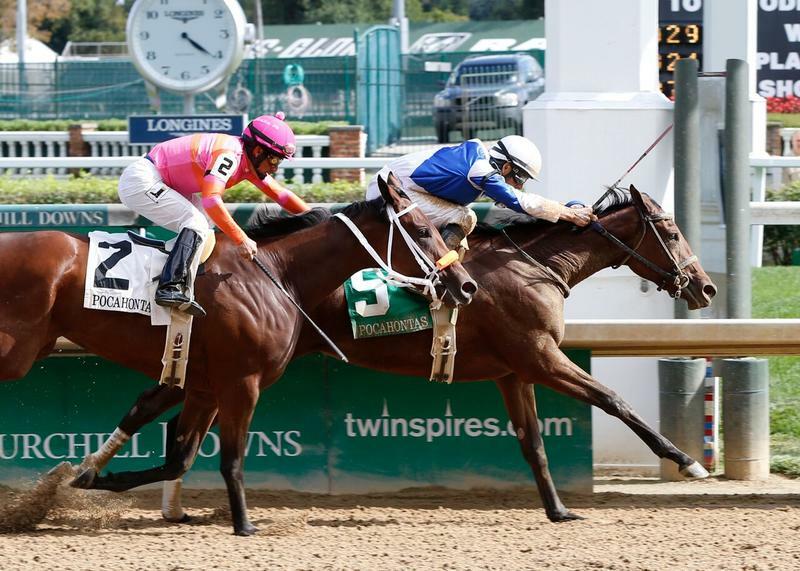 After reviewing video in a post-race inquiry, Kentucky Horse Racing Commission stewards disqualified Bold Quality from second to third for interfering with Dream Dance in the stretch. Meanwhile, odds-on favorite Just Wicked, sent to post at odds of 1-2 after an impressive winner of the $200,000 Adirondack (Grade II) at Saratoga four weeks ago, could only win a photo for fourth. Ridden by eight-time Churchill Downs leading rider Corey Lanerie, Dothraki Queen ran 1 1/16 miles in 1:45.80 on a fast track to remain unbeaten in two starts for trainer Kenny McPeek. The field of eight 2-year-old fillies was tightly packed on the final turn after Decked Out led the group early on through fractions of :24.13, :49.71 and 1:15.30. All but a distanced Vivid Storm were in contention at the head of the stretch but it was Dothraki Queen who emerged from the inside after patiently waiting for a hole to open. Dothraki Queen, a Kentucky-bred daughter of Pure Prize out of the Saint Ballado mare Sharaiji Blossom, was purchased for $35,000 at the 2014 September Yearling Sale at Keeneland. She banked $120,280 for the win on Saturday and guaranteed herself a starting spot in the $2 million Breeders’ Cup Juvenile Fillies (GI) on Oct. 31 at Keeneland. The Pocahontas is part of the Breeders’ Cup “Win and You’re In” Juvenile Fillies Challenge Division, which means the winner will also will have her entry fees and a travel allowance paid by Breeders’ Cup. Dothraki Queen also is the early points-leader on the Road to the Kentucky Oaks after collecting 10 points. 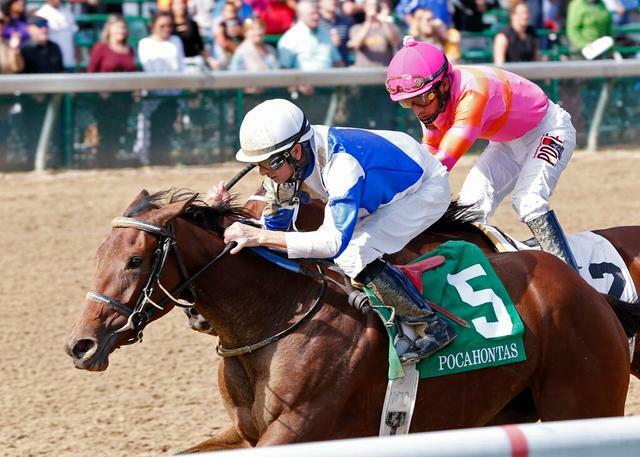 The Pocahontas was the first of 31 qualifying races to the $1 million Longines Kentucky Oaks (GI) to be run next May, and points were awarded to the Top 4 finishers on a 10-4-2-1 scale. Dothraki Queen paid $16.80, $6.80 and $8.60 as the 7-1 third-betting choice. Dream Dance, promoted to second under Brian Hernandez Jr., returned $15 and $14.40. Bold Quality, ridden by Paco Lopez and placed third, paid $8.80. Just Wicked, Decked Out, Princess Kennedy, Put Da Blame On Me and Vivid Storm completed the order of finish. Dothraki Queen entered the Pocahontas off a seven-length debut win over one mile on turf at Ellis Park on July 12. She was the only Pocahontas entrant with two-turn experience. COREY LANERIE, jockey of DOTHRAKI QUEEN (winner): “When I got through I thought we were going to win by five. She quickened that much and I was surprised. The two horse [Bold Quality] she was heads up with me turning for home and I just kind of took the hole from her and I didn’t expect her to be running at me towards the end, but she made it close. I thought they were going to get me for one minute. I don’t think my filly was going to let her by. She got to the front so quick and she’s a nice filly. With her having been on the grass this was my first time having ridden her on dirt, I didn’t know how she would take it in her face, but all the way down the backside I didn’t have much, but for a couple of times she had it and she pulled me forward.